All New Beginner's Guide with V2.0 Sample Code: For all versions of Windows, AutoHotkey offers the most powerful, flexible, free Windows utility software available. Anyone can instantly add more of the functions that they want in all of their Windows programs, whether installed on their computer or while working on the Web. 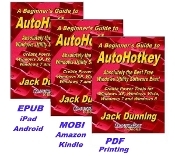 AutoHotkey has a universality not found in any other Windows utility--free or paid. For this third edition, released in December 2014, numerous tips, updates, and comments (most marked as Third Edition notes) give more insight into both AutoHotkey techniques and the state of the AutoHotkey language while still targeted at the beginner level. (Only one glaring error was found—which is now corrected.) Most chapters in this book have at least one or two new tips or updates. In the second edition, more chapters were added. In this third edition, the entire book was scoured and updated with more helpful information while ensuring greater accuracy. The second edition updated the entire book adding an "Index to Chapter Topics and AutoHotkey Commands", plus two new chapters on using AutoHotkey for gaming and common newbie AutoHotkey message and errors.